Skulls And Kisses | UK Lifestyle and Alternative Fashion Blog. : 100 Happy Days! So a couple of weeks ago I saw a post on Leona's blog about the 100 Happy Days project. I decided I'd take part cause it's fairly cool. So what is the project and why am I taking part? "We live in times when super-busy schedules have become something to boast about. While the speed of life increases, there is less and less time to enjoy the moment that you are in. The ability to appreciate the moment, the environment and yourself in it, is the base for the bridge towards long term happiness of any human being. 71% of people tired to complete this challenge, but failed quoting lack of time as the main reason. These people simply did not have time to be happy. Do you?" So what do you need to do to take part? It's real simple all you need to do is post a picture daily of something that has made you happy that day. It's so easy yeah? Yet 71% of people fail, mostly due to routine and not taking time out to appreciate the small things in life? So far this project has proved quite hard to remember to keep up with, I'm good at taking the photo's but not posting them! Haha. 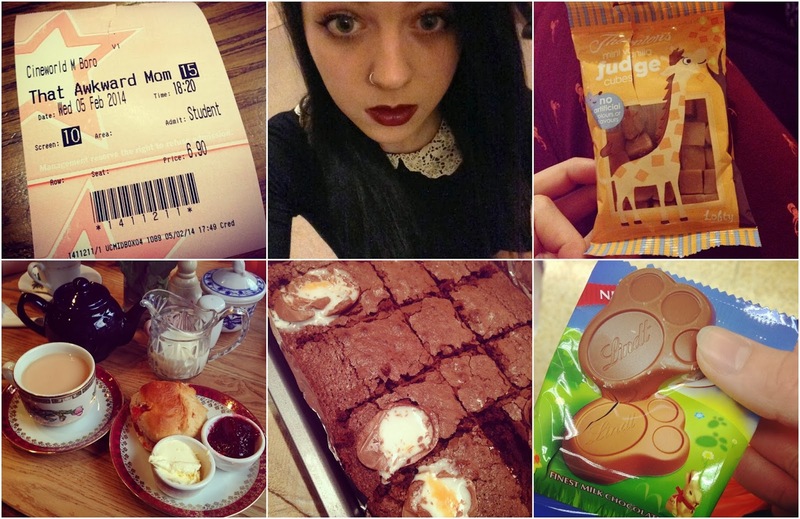 So every two weeks I'm going to do a round up posts of what's made me happy the past 14 days. So shall we see what's made me smile recently? Day 1. Pancakes for breakfast at Spoons with Abbey. Day 3. We went to help Mel pick some flowers out first thing on a morning and all the pretty flowers really brightened my day. Day 4. Finishing assignments is always a good thing right? I was so happy this day. Day 5. Sam came to stay, got off her face and went to Sumo with me so we could dance to Slipknot. Day 6. My Access All Asos parcel finally came! Pug socks who doesn't want Pug socks? Day 7. Mr Kipling Viennese Whirls always make my day they just taste so good! Day 9. I went to see That Awkward Moment with Abbey, I absolutely love Zac Efron films, he's so beautiful. Day 10. I love going to Creeps in Middlesbrough it's my favourite night out apart from Sumo and I got to dress all cute and look like Wednesday Addams. Day 11. Fridays were made for lying in front of the TV eating Fudge, this Fudge has a giraffe on the packet so it's clearly the best. Day 12. Afternoon tea at The Olde Young Tea House is just perfect. Day 13. Baking Creme Egg Brownies tho. Day 14. These Lindt paws are adorable and so nice to eat and omg I love them. So it's taken me a while to post this, it's been sat in my drafts for at least a week since I've been fairly busy oops. But it's finally up! Looking at these photo's it seems that food makes me happy quite a bit but oh well. Who doesn't love loads of food?! I hope you're all having a good week and I promise to take more time out to post when I'm not doing work! How's your week gone? 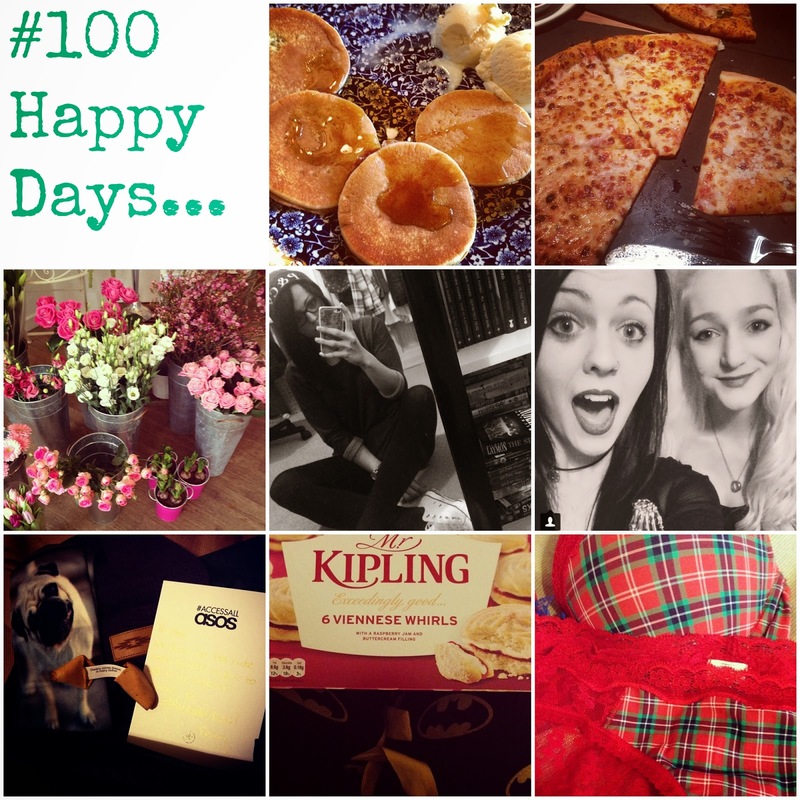 Have you been doing #100happydays?